Illustrated by Arthur Rackham. Peer Gynt is Norwegian playwright Henrik Ibsen’s most celebrated work, based loosely on the Scandinavian fairy tale character, Per Gynt. 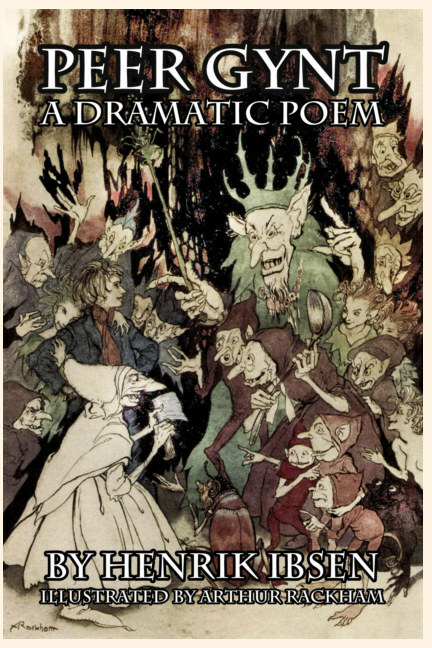 First published in 1867, Peer Gynt tells of the adventures of the seemingly amoral character of that name. The five-act play starts with Peer running off with the bride at another man’s wedding, and continues in a similar vein, including (but not limited to) outrageous adventures such as his drunken interactions with three amorous dairymaids who are waiting to be courted by trolls; his meeting the king of the mountain trolls; his departure to North Africa (where he earns money from the slave trade and sending idols to China); his adoption by a Bedouin tribe as prophet; his move to Egypt and his conversations with the Sphinx; and finally, his return home where he is confronted with an accounting of his life, and all the things that he has done wrong. In a dramatic final scene, he is confronted with the Button-moulder, who maintains that Peer's soul must be melted down with other faulty goods unless he can explain when and where in life he has been "himself." Ibsen’s play has been performed, debated, studied, and “interpreted” at the highest academic institutions across the world. In essence it tells of man’s striving to be better—and is an extreme example of man’s fall. Gynt is mysteriously attractive to women, a narcissist, a self-idolator, a liar, and a self-deceiver. But finally, he is called to account, and finds a way to justify his actions and to become a better person. Does he succeed? This remains the burning question . . .
Ibsen asked the composer Edvard Grieg to compose music for the play—which was done, the most famous of which became the suite popularly known as In the Hall of the Mountain King.